While playing Rune Factory 2 on the DS last year, I frequently wished for a larger screen. Not that the DS offering wasn't as grand or as deep as its predecessors, but there is no questioning the satisfaction of seeing your game played on a full size TV screen. Fulfilling that wish is Rune Factory: Frontier, Marvelous' newest offering that provides one of the very best Rune Factory experiences available, regardless of platform. 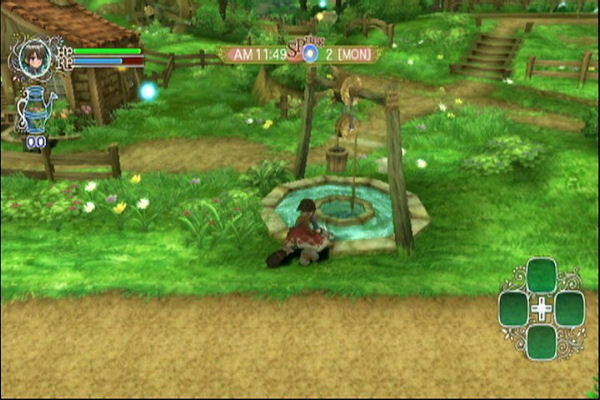 In true Rune Factory form, you play as Raguna, a young traveler with a touch of amnesia who has come to the town of Trampoli in search of his missing friend Mist. After Raguna reunites with Mist, he is all but commanded to take over an empty homestead and field at the outskirts of Trampoli, in order to keep Mist company as she takes time to find herself and discover who or what called her to the town in the first place. 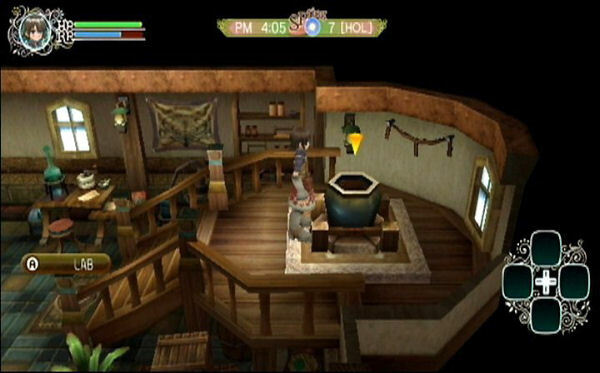 After moving in, you are given the chance to take part in all of the activities that makes the Rune Factory series complete: farming, forging weapons and tools, creating jewelry and other accessories, cooking, creating healing potions and other substances in your laboratory, exploring dungeons, and so on. With so many options, your life is left to become what you seek to make it. Unlike its DS counterparts, Frontier offers very little in the way of hand-holding once you are given a homestead. In fact, if you opt to go it alone, simply making a farmer's life for yourself, stopping into town only to buy new seeds, your game will never really progress. While you can spend an infinite amount of time doing said farming tasks, you'll never acquire the various other tools (fishing rod, axe, sickle, etc.) that make the game truly complete. 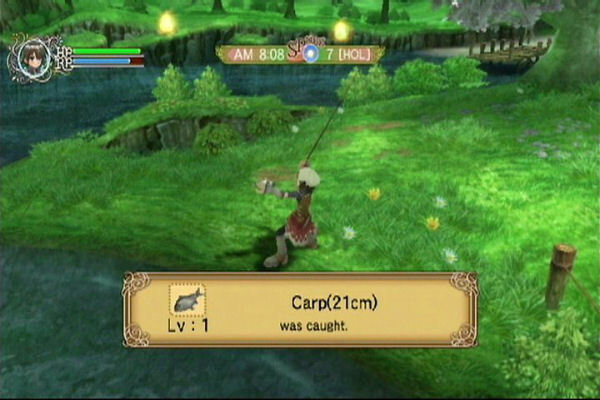 These items not only make farming itself easier (the axe lets you clear twigs and stumps from your yard, as an example), but in terms of items like the sickle and hammer, without them, you will find traveling through the game's dungeons to be an incredibly challenging task, as both tools can double as weapons. 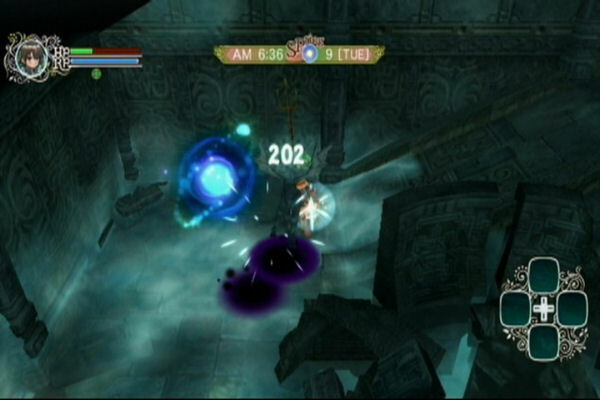 And without the tools necessary to take advantage of the game's dungeons (which can ONLY be found after acquiring the sickle), the main storyline will never progress. 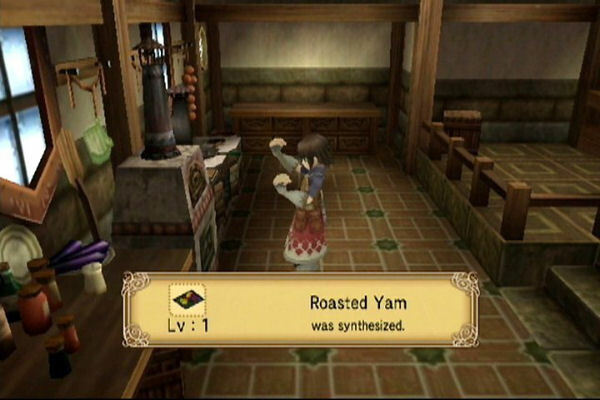 What this all boils down to is an absolute necessity to socialize with the various villagers in town, no matter how much you may wish to live your life as a recluse, as you will only receive these items after developing enough of a friendship with particular characters so that they feel you are worthy of giving them to you. Seeing that this is a Wii title after all, Frontier takes advantage of the Wii-mote motion sensitive capabilities by offering the option of simply swinging the Wii-mote in a motion resembling that of working with a hoe, sickle, watering can, etc. which causes Raguna to move in the same way. Unfortunately, the motion sensitivity is a bit too sensitive, frequently causing accidental movements which drain your precious Rune Points. Luckily, the motion control can be turned off altogether, allowing you to rely solely on the B Button to pick up items, and the A button to use tools or otherwise interact with your environment. 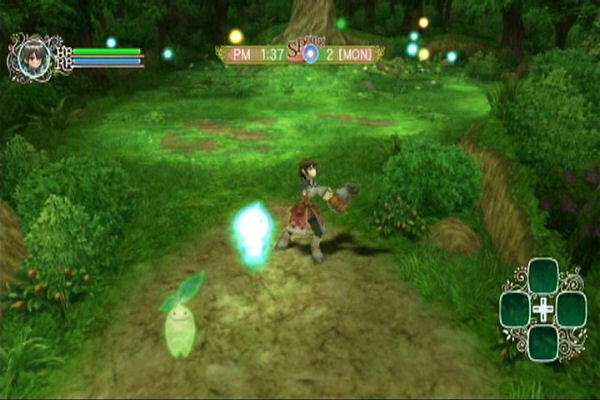 While all of these duties hearken to the original days of the game's inspiration Harvest Moon, Rune Factory became famous for its RPG elements, which allow you to enter into dungeons and fight various monsters (that can also be tamed and moved to your barn, where they can be trained to harvest crops and other tasks), and explore secret landscapes much like you would in any RPG. 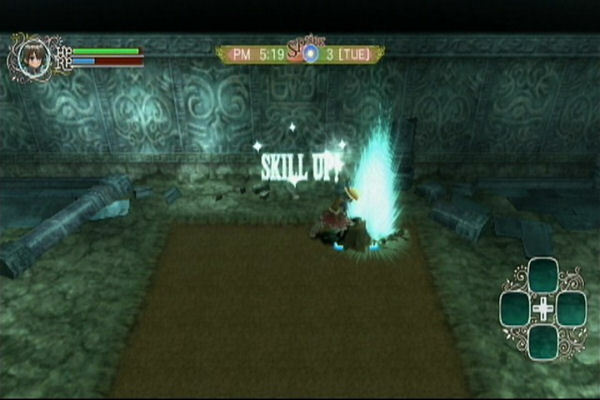 And as with most RP's, Raguna comes equipped with a HP (hit points) bar, along with a bar for Rune Points, or energy points, which allow you to not only enter into real-time combat with monsters, but also fulfill most of your routine responsibilities such as watering crops, chopping down stumps, destroying boulders, fishing, mining (smashing rocks with a hammer often yields minerals like iron) and so on. With every battle or swing of the axe, hammer, and so on, Raguna becomes a stronger, more efficient character, allowing him to expend less Rune Points for every action. That being said, it is likely that after creating a bustling farm and/or dominating the game's dungeons, you are still liable to run out of Rune Points before the day is done. This is where Trampoli's bath house steps in, allowing you to completely refill both your Hit Point and Rune Point balances. There are also a few food items that can accomplish the same tasks, for those times when the bath isn't open (just like a real world environment, people take days off in Frontier as well). As with previous Rune Factory titles, once you befriend enough of the female characters within the game, marriage becomes a real possibility, as does fatherhood. With so many girls to choose from, the game contains a staggering amount of replayability and different eventual life outcomes. Another change in addition to the larger number of marriage-worthy characters is the presence of Runeys, colorful floating spirits that are attracted to growing crops. You eventually come across a tool that is used to catch these Runeys, which can then be released over your own field to achieve various effects on your plants' harvest cycle, the quality of crops and so on. These Runeys are just a small part of the gorgeous aesthetic Rune Factory Frontier offers to players. Runeys themselves are multicolored sprites floating randomly around every corner, with the day and night cycle within the game allowing them to truly shine at night, when the rest of the world is asleep and the navy blue sky is filled with these adorable glowing creatures. The rest of the game is just as stunning, with both the graphics and the sound department showing a dedicated attention to detail. Characters are drawn as any traditional anime character would be, with lush backgrounds filled with green grass, wildflowers and rippling brooks being accompanied by the soft singing of birds or the pitter patter of rain on rooftops. 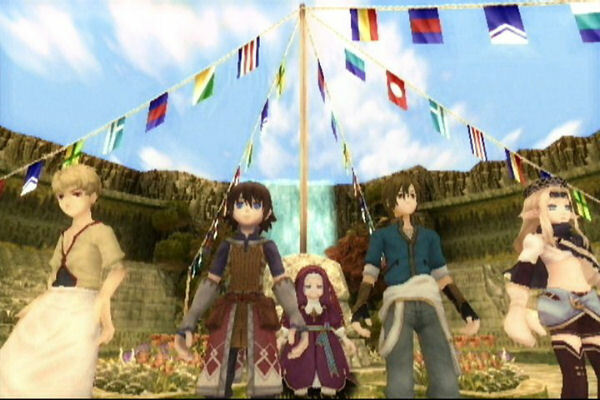 While Rune Factory: Frontier may leave you more to your own devices than other titles in the franchise, for those who are willing to jump in head first and dedicate a large amount of time to the title, most of the game's major elements can be unlocked within the first ten hours, allowing you to spend the rest of your time investigating the gorgeous world around you. While the DS versions of the game were fun in their own right, the gorgeous visuals, incredible soundtrack and complexity / depth of gameplay Frontier brings to the table drew me in more than any title before it. 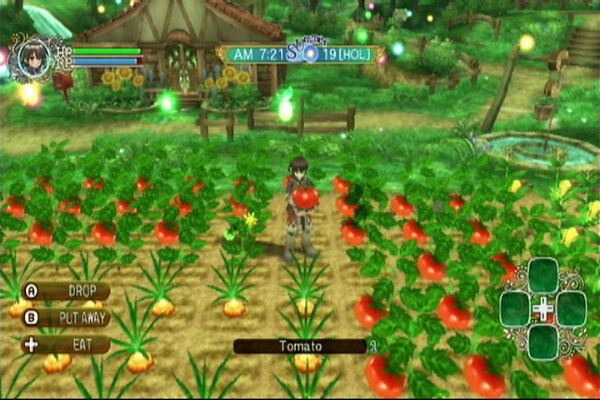 To put it simply, Rune Factory: Frontier is an incredible addition to the Nintendo Wii's lineup, and hopefully won't be the last. Special thanks to Sarah Irvin and XSeed for providing a copy of this title.